Annoyingly I’m not going to get as much benefit from the weekend as I’d like to. This evening I’m out for a curry with some friends and tomorrow I’m helping my Mum do some diy/decorating in the kitchen. I don’t have a problem but it is going to eat into *my* time quite considerably. That said, never look a gift horse in the mouth as they say. My drop pod is now at the stage where I need to mask bits off and airbrush some colour onto it. This should drastically alter the overall appearance of it and make it apparent that it’s a Space Wolves vehicle. also need to begin to rehash the base of my dreadnought for my Golden Demon entry. It shouldn’t be a major job, I need to glue on a load of slate, cork and gravel to build up the rockiness. I might even dremel out the sculpey tube a bit more to make it more craggy. 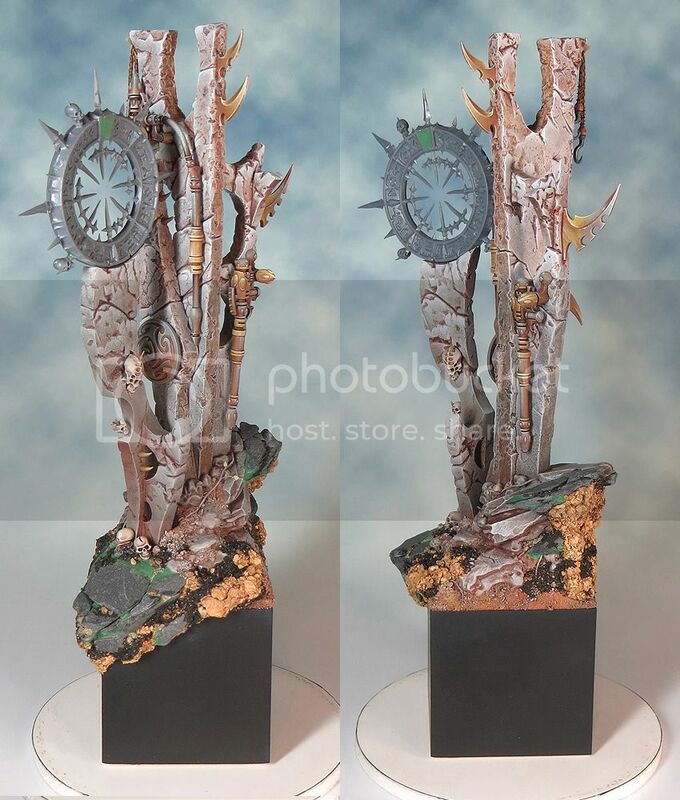 I can then carefully mask off the top, airbrush primer over the newly added bits and paint away to my hearts content 🙂 Looking around for ideas I’ve spotted how Sproket did the base on his Dark Eldar Diorama here, here and here. Additionally one really clever thing he does is to pour his GW paints into dropper bottles. I have no idea how well this works for the thicker base paints! 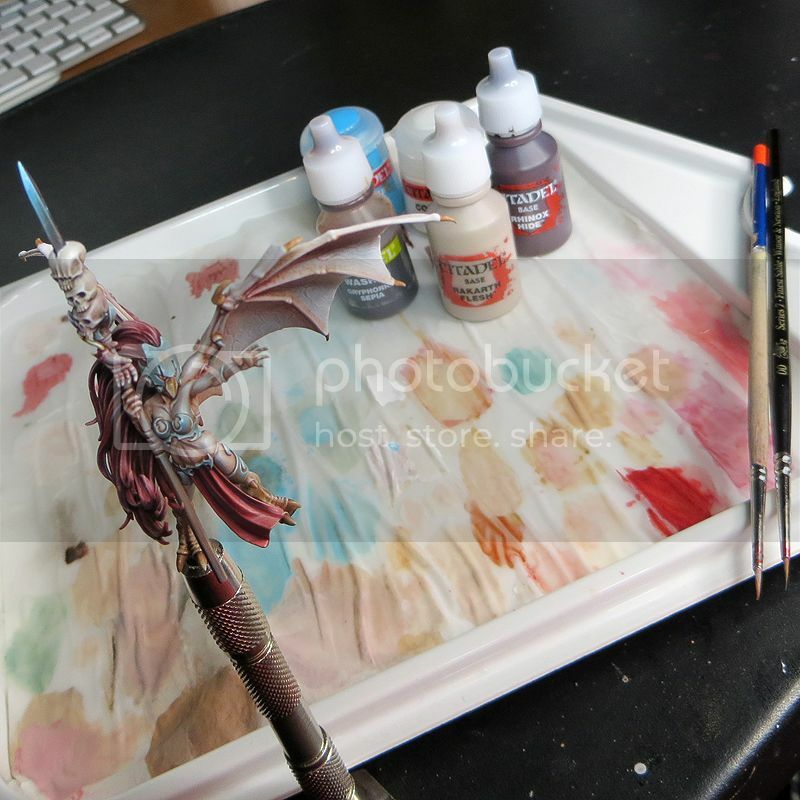 Finally I’d like to have a go at airbrushing the wings for my Forgeworld Blood Thirster Lord. I’ve had this model on my painting station for years now and never really got any of it painted. When I originally got it, I had no airbrush and my skills were not where they are now. What I’d love to do is to prime the wings light grey and then work on painting them a dark brown grey colour (Charadon Granite-esq). Ideally I’ll pick up one of the new GW paints to use as a base.